Coverage: Live text commentary of every stage on the BBC Sport website. BBC Radio coverage on 5 live sports extra and/or website from 14:30 BST on every stage. Team Sky said they would not "risk cheating" after claims their jerseys were illegally designed for the opening time trial of the Tour de France. 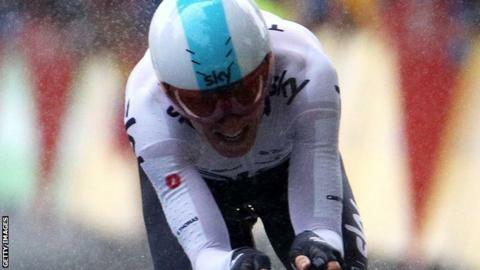 The British team had four riders in the top eight on Saturday, with Geraint Thomas taking the yellow jersey. 'Bubble pads' - small raised dots - featured on the upper arms of several Sky riders' jerseys. Race jury president Philippe Marien said: "It is an actual part of the jersey." Team Sky sports director Nicolas Portal said they "abide by rules", adding: "Other big teams have been using it. "It's legal. Everybody knows the rules. It does not give you a big advantage but it's those little things, so why not use them? "Everything has been validated. We would not take the risk to cheat and lose everything on the first day." Among the Team Sky riders to finish in the top 10 was defending champion Chris Froome. "It's enhanced aerodynamics and the regulations forbid it," said Frederic Grappe, performance director at the FDJ team. "According to studies, the estimated gain is about four to seven percent. It's huge." Italian Marco Pinotti, a coach at BMC Racing, told Reuters: "It seems to me this 'equipment' is on the borderline with the rules but if it's judged compliant with the rules then I accept it."